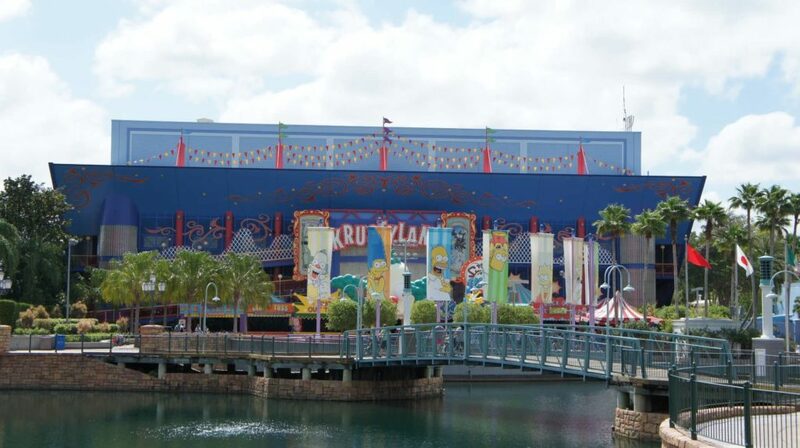 Although The Simpsons Ride replaced Back to the Future: The Ride in 2008, the surrounding Springfield, USA area didn’t arrive until five years later – and it took another four years before it would be sliced off from the greater World Expo section and spun into its own separate land on the Universal Studios Florida map. When it finally arrived, it was the first land to be based exclusively off of a licensed property at the theme park, paving the way for The Wizarding World of Harry Potter – Diagon Alley just a year later. There are a number of experiences, culinary delights, and Easter eggs for the Simpsons fan in your family (and for the non-fans, it still provides some of the most fun to be had at Universal Studios). Join the iconic Simpsons family on The Simpsons Ride, a simulator experience, as they take a vacation through the Krustyland amusement park. After your ride, pop into the Kwik-E-Mart for Simpsons apparel and souvenirs. Then join an alien invasion on Kang & Kodos’s Twirl ‘n Hurl, a classic spinner, for some simple thrills and lots of humor. And if you get hungry while touring the famed town, stop by Moe’s Tavern, Duff Brewery, or The Simpsons Fast Food Blvd to explore a one-of-a-kind collection of food and drinks, including Krusty Burgers and Flaming Moe’s. When you are ready to learn more, use the navigation links at the bottom of the page to explore the individual attractions.